We are a small, family run facility. Drop off's, pick up's, and tours must be arranged during business hours and are by appointment only. Arrivals outside of the pre-scheduled time frame may not be accommodated. Tours are not scheduled one week before or one week after a holiday. Our driveway / perimeter gate is electronic. For our boarders additional safety, is kept closed during and after business hours. It is only opened when a pet is dropped off or picked up. WITHOUT A COMPLETE AND CURRENT SHOT RECORD. **NOTE: Dogs that board with us coming from areas where the H3N8 & H3N2 flu virus is prevalent, MUST be vaccinated for these strains a minimum of 30 days before arrival date. This can be waved depending on the type of heartworm medication the dog is on. Dogs must be on a flea and tick preventative applied within 30 days prior to boarding. Cats must be on a flea and tick preventative applied within 30 days prior to boarding. Verification of valid and current (within 1 year) vaccination records will be confirmed by JCM's with the owner's Veterinarian prior to pet entering our premises. We must also have a copy for our file. This deposit will be incorporated into the boarding total. Holiday Cancellations: must be made at least 14 days prior to the arrival date in order to receive a full refund of the deposit. Otherwise, the deposit is non-refundable. This includes same day reservations, and reservations made less than 14 days prior to arrival date. Non-holiday Cancellations: must be made at least 7 days prior to the arrival date in order to receive a full refund of the deposit. Otherwise, the deposit is non-refundable. This includes same day reservations, and reservations made less than 7 days prior to arrival date. We work by appointment: At the time of booking we require a "time" when the pet is to be dropped off and picked up. If a time cannot be provided, the pet's reservation will not be confirmed. We require a $50.00 non-refundable deposit for non-holiday tentative booking. Please view "Read Before Booking" for complete information. We accept all breeds of dogs, and all temperaments. We can accommodate puppies as young as 8 weeks. However, even though the chances are low, they are still at risk of infectious disease without their complete set of shots. We have special areas set up just for geriatric dogs. These dogs are given the extra care, patience, and attention they deserve in their golden years. Dogs from the same household or from family members boarded together in the same enclosure qualify for the "additional dog discount." Multiple dogs boarded in the same enclosure must be able to free feed, (food is available at all time). IF THE DOGS ARE NOT ON A FREE FEED REGIMEN, THEY MUST BE BOARDED IN SEPARATE ENCLOSURES. Also, dogs must not exhibit guarding behavior, (one dog won't allow the other dog to come into the enclosure, or won't let the other dog eat). If dogs need to be separated to eat, or for any other reason, separate enclosures must be reserved. Each dog will be subject to full price. Payment is to be made when pet is picked up. No pet will be released unless payment is made in full. Type of payment is at kennel owners discretion. Clients boarding a pet 30 days or longer are required to pre-pay. If a pet is initially checked in without a definite departure date, even with the intention of boarding less than 30 days, a full 30 day payment must be made at time of check in. Any overpayment will be refunded. If payment is not received, or credit card will not process on the due date, you will be notified by phone. If payment is not received 5 (five) days after due date, it will be assumed that pet has been abandoned and ownership of said pet relinquished. No further contact will be deemed necessary. At this point said pet will be surrendered to the local animal shelter. Dogs do not have to be spayed or neutered to board at our facility. A bath on their departure date is not required, but is recommended. Especially if your pet has participated in our Interactive Daycare. Since dogs are not housed on concrete, but instead have an actual acre of real grass to run and play on, they are subject to get dirty and smelly. Cost depends on the size of the dog and coat type. Pets entering our facility found to have fleas will receive a flea treatment at the owners expense. 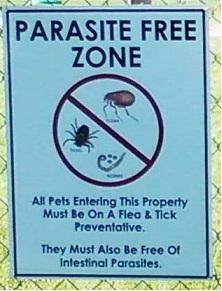 Pets found to have ticks upon entering our facility will not be permitted to stay. We accept bedding brought from home, provided it is washed and clean. We provide orthopedic beds for all of our guests. If your dog is prone to chew on his bedding, it will be removed from his enclosure. One or two toys from home is fine. Since there are so many different brands and varieties of dog foods, there is no one food we can provide that any of our boarders can eat without possibly causing an upset stomach from switching the food abruptly. Therefore, you must bring your dog's regular food from home. You can either put the required daily amount in labeled baggies, or bring the whole bag, or bags along with feeding instructions. There is no charge for feeding. Treats are also provided at no charge. Sanitizing: We sanitize the area where your pet stays, everyday. We also sanitize and steam clean all indoor areas before a new guest arrives. We are not able to accommodate sick and injured animals. We cannot board any animal that is up for adoption, or being rehomed, either by the owner, or an organization. We are not able to take in, or house rescues, lost pets, or strays. JCM's reserves the right to refuse the boarding of any animal at our facility. receive a bath on the return date. Cost is determined by size and coat type. "Closed Sunday" means that the boarding facility's office is not open to the public. However, since we live on site, your pet is getting the highest quality of care. Boarding Rates: Charges are based on a "per night" basis. Boarding rates are determined by the dogs weight. *See attached price list. * Dogs are weighted on a calibrated veterinary scale when they check in. We do offer discounts for additional pets from the same household and for long term boarding. We do not accept pets for drop off or pick up before 9:00 AM Monday thru Friday, (10:00 AM on Saturday). **If you are boarding your pet with us for the first time, you must arrive no later than 1 hour prior to our closing. This provides for adequate time to fill out our boarding contract, and allows your pet ample time to settle. Home Pick up and Delivery: Arrangements can be made to have your pet picked up and or dropped off at your home, or pre-arranged meeting place, (Vet , groomer, etc). Pets will not be picked up or delivered unless verbal conformation is made on that day, prior to leaving. Cost of pick up and delivery is $30.00 and up (depending on location) each way. Sunday pick up and delivery (when available) is $85.00 and up (depending on location) each way. For a list of pick up and delivery charges click on "Pick Up and Delivery Rates.") Home pick up and delivery is generally scheduled after our Pet Boarding Facility closes for the day. Pets picked up or dropped off "after hours" will not be charged for that night. There is no charge for pets picked up or dropped off at any of our Dog Training Class locations (Metairie, Westbank, Northshore) provided class is being held that night. If pre-arrangements have been made for pick up or drop off at class, and that class is canceled for whatever reason, and the pet is still to be picked up, there will be a minimum $30.00 charge (depending on location). If pre-arrangements have been made for pick up or drop off at class, and the owner doesn't show up, ie. forgot or got busy with other things, it will be the owners responsibility to make other arrangements to get the pet to us or pick up the pet. A copy of your pets shot record must be current (within one year) and provided to us for our files. No pets will be admitted without a complete and current shot record. Once given, it takes 48 hours for vaccines to become effective. Make sure your pet is vaccinated at least 2 days prior to boarding. Fleas and Ticks: All pets are required to have a flea treatment prior to boarding. Pets are checked for fleas and other parasites upon arrival for boarding. If pet is found to have fleas, a dose of Frontline Plus will be applied at the owner’s expense. *See attached price list. * Any pet found to have Ticks will not be boarded at this facility. If ticks are found after pet is dropped off, the pet will be brought to and boarded at either the owner’s Vet, nearest Vet clinic, or local Shelter. Payment: Payment is to be made in full when pet is picked up. No pet will be released unless fees are paid in full. Dogs scheduled for home delivery (with no one home) must pre-pay for service. If you are unsure as to how long your pet will be boarded, you will be required to pre-pay for a 30 day period. Any overpayment will be promptly refunded. Type of payment: We accept personal checks, credit cards, money orders, traveler checks, bank notes, and cash. We do not accept third party checks. We do not accept post dated checks. There will be a $25.00 service charge on all NSF checks. Type of payment is at kennel owner’s discretion. Long Term Boarding: Clients will receive a $2.00 per day discount on any pet boarding 30 days or longer. Clients boarding a pet 30 days or longer are required to pre-pay. Payment is to be made when pet is checked in. Any over payment will be refunded. If payment is not received on the due date, you will be notified by phone. If payment is not received 5 (five) days after due date, it will be assumed that pet has been abandoned and ownership of said pet relinquished. No further contact will be deemed necessary. At this point said pet will be surrendered to the local animal shelter.